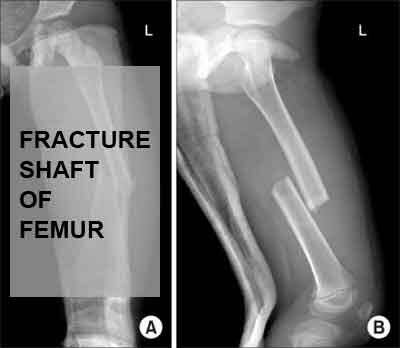 Fractures of the shaft of the femur are the result of high-energy trauma and therefore can be both life-threatening injuries and causes of severe permanent disability. Isolated injuries can occur with repetitive stress and may occur in the presence metabolic bone diseases, metastatic disease, or primary bone tumors. The femur is very vascular and fractures can result in significant blood loss into the thigh. Up to 40% of isolated fractures may require transfusion, as such injuries can result in loss of up to 3 units of blood. This factor is significant, especially in elderly patients who have less cardiac reserve. Most femoral diaphyseal fractures are treated surgically with intramedullary nails or plate fixation. The goal of treatment is reliable anatomic stabilization, allowing mobilization as soon as possible. Surgical stabilization is also important for early extremity function, allowing both hip and knee motion and strengthening. Injuries and fractures of the femoral shaft may have significant short- and long-term effects on the hip and knee joints if alignment is not restored. Primary health centre level : The doctor on duty should recognise the features of fracture and disloction. Only first aid including the splintage and intravenous drip should be given. In open fractures Tetanus toxoid can be given. 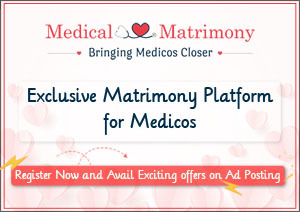 There is no need to waste time in preparation of medico-legal formalities. The injured should be referred to the higher centre earliest feasible causing no further harm. 1. Investigations : X-rays of the part including hip and knee and of other areas if required, x-ray of pelvis with both hips is must. 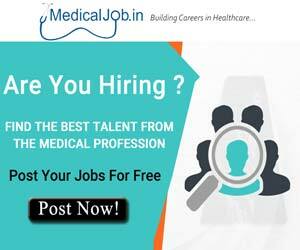 General Investigations and specific if required according to the status of the health of the patient. 2. Treatment : Conservative management of fractures in children in spica cast or with skeletal traction, Kuntscher’s nail for isthmic fractures, Interlocking Nailing in comminuted fractures, Plating for lower third fractures, Plating of shaft femur fracture in children. b. Patient with co-morbid conditions requiring multiple speciality care. c. Non unions / Neglected fractures. f. Non unions / Neglected fractures and failed osteosynthesis. g. Fractures associated with neurovascular injuries/Suspected Fat Embolism. h. Suspected HIV positive cases. i. Fractures associated with any condition requiring higher investigations like CT scan, MRI etc. 1. Investigations : X-rays of the part and of other areas if required, x-ray of pelvis with both hips is must. General Investigations and specific if required according to the presence of any co-morbidity. 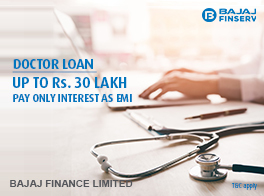 Special investigations like MRI/CT scan or angiography if required. 2. Treatment : All the treatment given at situation 1, Closed/Open Interlocking Nailing, DCS/Distal femoral Nail or Plate for Supracondylar/Intercondylar fractures, External fixator/Enders/solid undreamed Nail for open fractures, Fibular grafting with plating and cancellous bone grafts for non unions, Illizarovs Ring Fixator, Rail road fixator for gap defects, Plastic/Vascular surgeon assistance.